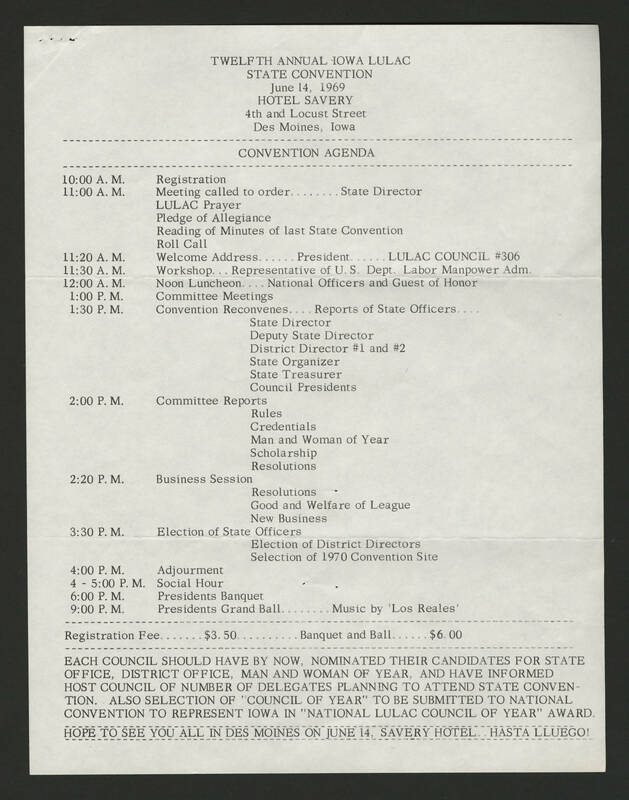 TWELFTH ANNUAL IOWA LULAC STATE CONVENTION June 14, 1969 HOTEL SAVERY 4th and Locust Street Des Moines, Iowa CONVENTION AGENDA 10:00 A.M. Registration 11.00 A.M. Meeting called to order ...... State Director LULAC Prayer Pledge of Allegiance Reading of Minutes of last State Convention Roll Call 11:20 A.M. Welcome Address .... President .... LULAC COUNCIL #306 11:30 A.M. Workshop .. Representative of U.S. Dept. Labor Manpower Adm 12:00 A.M. Noon Luncheon ... National Officers and Guest of Honor 1:00 P.M. Committee Meetings 1:30 P.M. Convention Reconvenes ... Reports of State Officers ... State Director Deputy State Director District Director #1 and '#2 State Organizer State Treasurer Council Presidents 2:00 P,M, Committee Reports Rules Credentials Man and Woman of Year Scholarship Resolutions 2:20 P.M. Business Session Resolutions Good and Welfare of League New Business 3:30 P.M. Election of State Officers Election of District Directors Selection of 1970 Convention Site 4:00 P.M. Adjourment 4-5:00 P.M. Social Hour 6:00 P.M Presidents Banquet 9:00 P.M. Presidents Grand Ball ...... Music by 'Los Reales' Registration Fee ..... £3.50 ...... Banquet and Ball ..... $6.00 EACH COUNCIL SHOULD HAVE BY NOW, NOMINATED THEIR CANDIDATES FOR STATE OFFICE, DISTRICT OFFICE, MAN AND WOMAN OF YEAR, AND HAVE INFORMED HOST COUNCIL OF NUMBER OF DELEGATES PLANNING TO ATTEND STATE CONVENTION. ALSO SELECTION OF "COUNCIL OF YEAR" TO BE SUBMITTED TO NATIONAL CONVENTION TO REPRESENT IOWA IN " NATIONAL LULAC COUNCIL PF YEAR" AWARD. HOPE TO SEE YOU ALL IN DES MONIES ON JUNE 14 SAVERY HOTEL HASTA LLUEGO!